My first interaction with Vampire Weekend came in the form of a promotional video on MTV in my freshman year of high school. At the time, I felt I was a true “scene kid”. For those of you unfamiliar with the term, I simply wore an excess of eyeliner two shades too dark, owned too many slim-fit band shirts, and listened to an obnoxious amount of pop punk. (To this day, however, Yellowcard still holds a place in my heart. I watched them live last April for purely nostalgic purposes and to my “sheer delight” they were opening for All Time Low. I mention All Time Low with pure sarcasm as I recall the overwhelming amount of bras that were littered across the stage as their lead singer accepted them all too willingly. This somehow destroyed the beautiful set that Yellowcard embraced me with prior to them.) I was extremely narrow-minded with my taste in music. I found myself to be all too original, scoffing at the other students who lost themselves in the bass and beats of Rihanna and KIIS FM. I didn’t realize at the time that a larger world existed outside of these two genres that explored all realms of musical possibilities. Anyways, I can reminisce on this moment so well that I remember sitting cross-legged on the floor of my bedroom; I was attempting to conquer algebra homework. The opening riff to Vampire Weekend’s “A-Punk” music video, along with a combination of the bass drum count in immediately shifted my mind’s focus from formulas to the television. My eyes widened upon viewing a mess of brightly colored sweaters. Ezra Koenig and the others to appear to be moving abruptly but yet playfully all at the same time throughout the video. My first interaction with Vampire Weekend was, essentially, visually and musically pleasing. I had never heard anything like this before. It had such a quirky feel to it that I did not think MTV was capable of broadcasting it. “A-Punk” has your typical lead guitar riff, drums, etc. Yet it somehow manages to throw in interludes of flutes and choruses of “Hey! Hey! Hey!” to set it apart from anything that Damien Fahey usually raved about on TRL. It’s strange to think that TRL doesn’t exist anymore, huh? I considered it to be the last bit that kept MTV music related. A week later my iPod still appeared to be very characteristic of the music I had been listening to, but with Vampire Weekend ironically tossed into the mix. However, scroll through my “Top 25 Most Played”, and the first half of the playlist undoubtedly consisted of their entire first self-titled album. Needless to say, I was hooked. Vampire Weekend had a way of starting my mornings and ending my nights, to put it in a romantic, cliché sort of way. It was the African influenced drums that accompanied me to class and the slow, basic riff of the bass that lulled me to sleep (Think “The Kids Don’t Stand a Chance” as you try to picture a way that Vampire Weekend actually has the ability to slow the pace within their first record.) I was infatuated with them for the remainder of my freshman year and it continued into sophomore year, gradually fading as I began to explore other musical interests. My interest in the band was re-sparked once I learned a new album was to be released midway through my junior year of high school. I will admit I was a little nervous upon hearing this news. Would it be as great as the first album? Were they to be yet another band that would be unable to live up to the greatness of an amazing first album? (You can all point fingers and make assumptions at whom I may be referring to in this case.) However, these apprehensions were made prematurely. Contra immediately caused a rebirth in my previous infatuation with the band. The album is, without a doubt, extremely different from the first. It’s actually rather hard to explain exactly just how it sounds different. There’s something about Contra that takes an experimental approach, and yet it stays true to the eccentric style of Vampire Weekend. In fact, its familiar eccentricity is what caused my love for the band to grow exponentially, but it is also what caused me to heighten my respect for them. You can’t deny it. It is very typical for a band or an artist to attempt to conquer something new when it comes to a sophomore album that ends up going through the awful means of conforming to a favorable genre of the current music hype. This, ultimately, causes he, she or them to leave the music scene in tears as a washed up, nostalgic memory in people’s I-tunes. Compare this to all the Disney “sequels” to classics that go straight to DVD. Apparently there are three Cinderella films. It’s just not a favorable outcome, yet it is unfortunately the norm in entertainment. Contra loaned itself to my “Top 25 Most Played” for the majority of that year. At the time, it also introduced me to an indie music magazine that I would grow to love and eventually intern for, Under the Radar. 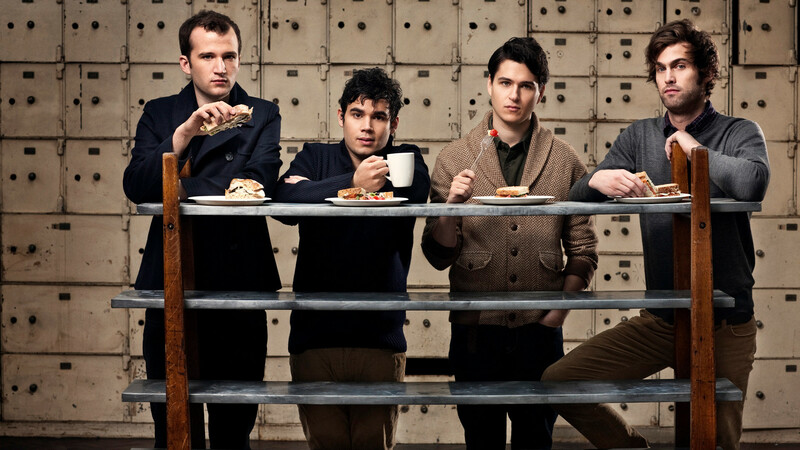 Vampire Weekend happened to be gracing their cover the month the album was released. Unknowledgeable of what the magazine was about at first, I mindlessly bought it simply because of its cover, which I’m realizing now is a very typical means of attracting new readers to magazines. It parallels the statement of judging a book by its cover, basically. Because of this, I was introduced to an entirely new world of music. Behind the radio was a subgenre of indie that had its own means of gaining hype without claiming singles on the radio. Under the Radar simply promoted its pure greatness, covering topics all across the music border, from interviews with musicians, album reviews and even music related book reviews. I was hooked and ecstatic to learn that their base was in Beverly Hills so I e-mailed them a few months into my subscription, begging to work with them. It was definitely worth the hour drive in the smog and Los Angeles traffic to work with these wonderful people. That fall, I was blessed by the indie music gods with tickets to watch Vampire Weekend live at the Hollywood Bowl. I had tried to get tickets to their shows for months, but they, of course, would sell out within the first few days of being released into “the wild”. I eagerly sat at the computer the hour that the tickets went on sale, refreshing the page every ten minutes. Was it worth it? I can say this whole-heartedly and emphatically, yes. They enthusiastically played every song they had ever made with the exception of “The Kids Don’t Stand a Chance.” Yes, I do remember this very detail. I remember this because their ability to perform this massive set list within two hours immensely impressed me. Vampire Weekend’s performance sounded exactly like their albums, but to an even better amplified extent, complete with chandeliers and neon lights accompanying their enthused harmonies, chords, and dance moves. It truly lived up to my every expectation. A year goes by since Contra is released. I find them to be at a stage in which a third album certainly does not need to be in the works. A second year scurries on by. Vampire Weekend is still able to leave a decent impression from the album despite its release two years ago. The time is now two years and one month since the release. Out of curiosity, I’ve checked their website, SPIN magazine, any news releases on Google revealing the possibility of a third album at work in the studio, yet I’ve found nothing. The last few bits of their most recent news consist of DJ sets and a cancelled show from August 2011. I hope I am not the only one who is slightly bothered by this. As Vampire Weekend continues to slowly drop from the planet’s existence, I pray that they don’t pull a move that The Shins recently conjured, waiting five years following the release of Wincing the Night Away (2007) to come back so much later with the upcoming Port of Morrow (March 2012). Even worse, I fear what fans fear the most of beloved musicians: a potential breakup? Fortunately, I did not come across anything of the sort in my Google searches so let’s just hope the band is going through…a transitional phase? For the time being, I’d like to thank Vampire Weekend for opening my eyes to new genres of music and a love for African drums. Come two years from now, it will be a plea to write more music!